I went to explore Oslo here the other day. Oslo by night is such a beautiful sight. The water was covered in the colours of the sunset. Sunsets have for as long as I can remember been something I’ve admired. The beauty of this night was no different. Seeing the many sculptures of the people walking by sure is beautiful. The walk alongside the water is at any time of the day a nice way to explore the city. It’s an urban alternative to a hike in the woods which I do when I’m at home. 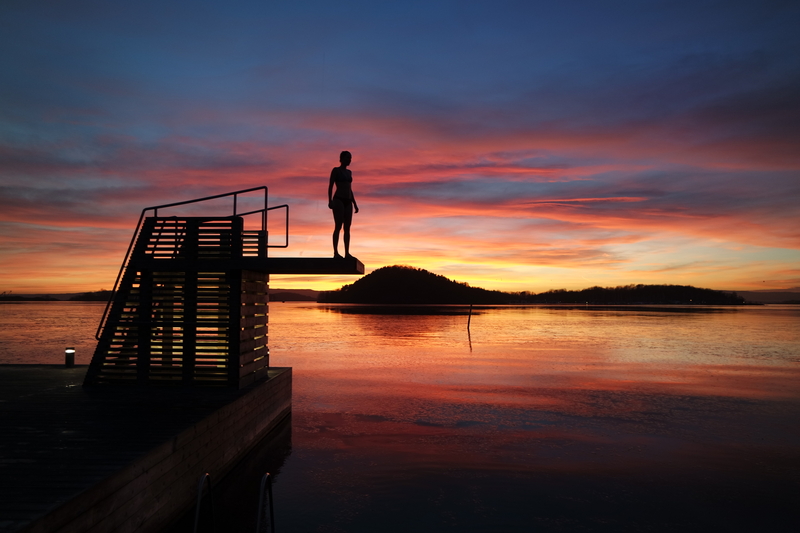 Bymiljøetaten in Oslo, The Urban Environment Agency of Oslo, want to highlight six different part of Oslo during the holidays – and so do I. I want to highlight a place where the ocean meets the city. Where the Opera meets Sørenga, which is a place where you can come for a swim, a bite to eat or just for a walk. The walk alongside the water, Oslo Havnepromenade, extends along the entire waterfront, from Frognerkilen west to Kongshavn east. Here you can experience the fjord, art, architecture, relax on a bench in the sun, go for a swim, skate, bike, shop or simply just go for a walk and enjoy the scenery like I did. Oslo has a little something for everyone. When standing at the midst of Sørenga you can see large cranes that help to construct what will be our future Oslo and large cranes that load containers from all around the world. On the other hand you can see the Opera and the barcode beside it. I met a lovely girl who is living in Oslo but is originally from Germany. She had come down to Sørenga for a swim. It was about 0 degrees outside and flakes of ice was floating in the water. Sørenga opened in June 2015 and got quickly known for its swimming possibilities during the summer and now winter. Refreshing to say the least. Alongside the water you can stop for a bite on one of the many restaurant. Whether you fancy an espresso or a burger at Bun’s – the options are many. Try Bun’s Burgers The Al Gore if you’re like me and don’t eat meat. If you do eat meat you’ll for sure find something you’ll love on their menu. Amongst all the beautiful apartments on Sørenga you’ll find the Norwegian Tourist Association, Friluftshuset. Friluftshuset is an inspiration, activity and gathering place for you who wants to be active in and around Oslo. You can bring your kids for indoor gobbling in the bouldering room, rent kayaks and take kayak classes, attend a yoga class, join inspiration evenings. Just to name a few of the many things they offer. They also offer different trail lines and practical outdoor equipment that you can buy at the Tursenter. You can also get involved as a volunteer in DNT Oslo og Omegns work. Make sure to enter Bymiljøetatens Instagram competition. If you’re ever in Oslo just post a picture letting everyone know what your favorite spots to explore in the city are. The competition ends on the 15th of January. Remember to hashtag #OpplevOslo! Here you can see more of my pictures from Oslo.